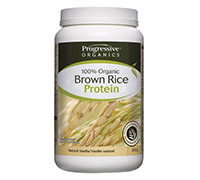 Progressive Organics Brown Rice Protein is made entirely from certified organic, non-GMO ingredients. The protein itself is derived from sprouted brown rice. Typical rice proteins are made from white rice, which offers an incomplete amino acid profile and a poor protein efficiency ratio. Sprouted brown rice, on the other hand, has a complete array of amino acids, which are essential for the maintenance of good health. It also has a net protein utilization score of 98.8% and is vegan, hypoallergenic and gluten free.